Wolfgang Carpet & Upholstery Restorer removes tough stains from carpet and seats. Water-based cleaner will not dry out fibers. Clean and restore your vehicle's interior for lasting beauty and value. Wolfgang Carpet & Upholstery Restorer is a professional quality carpet cleaner that removes your vehicle's worst stains to restore a factory-new appearance. Wolfgang Carpet & Upholstery Restorer lifts and removes stains from the carpet and fabric fibers without altering the look or feel of the materials. Wolfgang Carpet & Upholstery Restorer leaves your cockpit looking and smelling fresh and clean. Though strong enough to conquer tough dirt and stains, Wolfgang Carpet & Upholstery Restorer will not fade, spot, or affect the color of fabric or carpet, and it will not break down fibers. It does not contain harsh chemicals or harmful fumes. 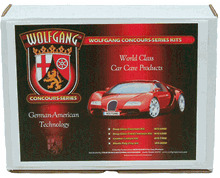 In fact, Wolfgang Carpet & Upholstery Cleaner bears Wolfgang's aromatic, signature scent. Your car's interior will look and smell refreshed. Wolfgang Carpet & Upholstery Restorer works wonders on carpets, upholstery, walls, rugs, floors, high traffic areas, and fabrics in the home, boat or RV. This water-based cleaner is safe and effective on any surface. 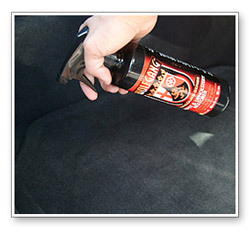 Use it on floor mats, door panels, fabric and velour seats, steering wheel, and headliners. 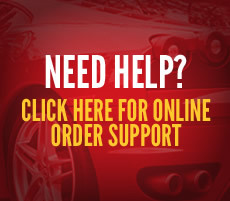 You will be amazed at how quickly and easily your car's interior is cleaned and restored!